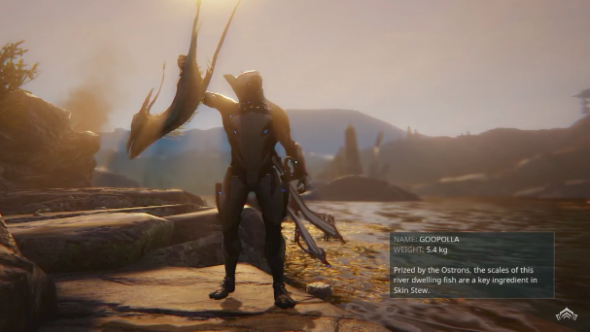 It’s all change for Warframe. Digital Extremes revealed in a livestream tonight that its procedurally generated corridor shooter is going open world, you’ll meet a whole new race of people, and you’ll be able to fly across the land in your archwing. The most exciting new feature? It’s got to be spear fishing. Here’s everything we know about Plains of Eidolon. Speaking to us ahead of the livestream, live ops and community producer Rebecca Ford told us that the open-world section will be set along a coastline [link] and populated by a race of scavengers. And what do scavengers living along a coastline do for food? Fish, naturally. I’m certainly looking forward to spending an evening skimming across the Eidolon sea in my archwing flight suit and spearing fish in the waters below.